Connetquot River State Park is located in Oakdale, New York within Suffolk County. 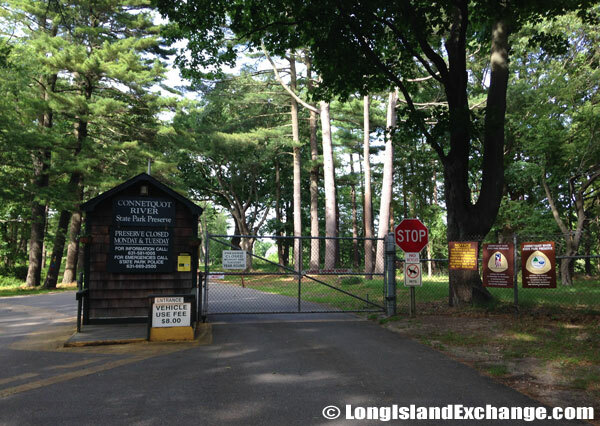 Directions: From western Long Island: Southern State Parkway east to exit 44 (Sunrise Highway), east to the Preserve. From eastern Long Island: Sunrise Highway west to Oakdale. The Preserve is located on the north side of Sunrise Highway, just west of Pond Road. The park is not accessible on the south side so if you are headed to the park from the west, you’ll pass it and come back around. Contact Information: Connetquot River State Park Preserve, 3525 Sunrise Highway, Oakdale, New York 11769, Phone: (631) 581-1005. 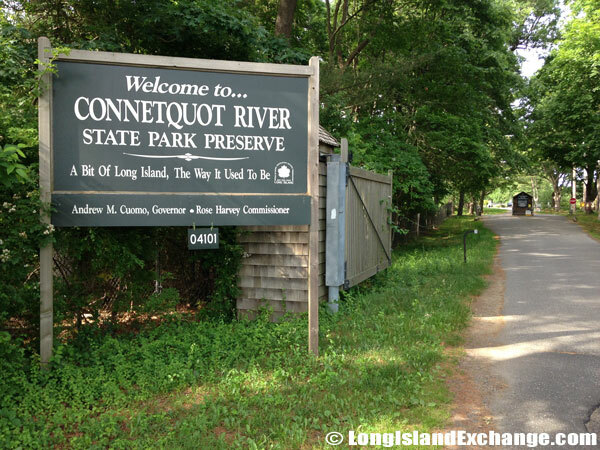 A sign welcomes visitors and residents to Connetquot River State Park, a state park in Suffolk County, on the South Shore of Long Island. A permit is required for entrance to the park. Fees: Cars $8, Non-Profit Buses (By permit only) $35, Commercial Buses (By permit only) $75. A permit is required for entrance to the park. 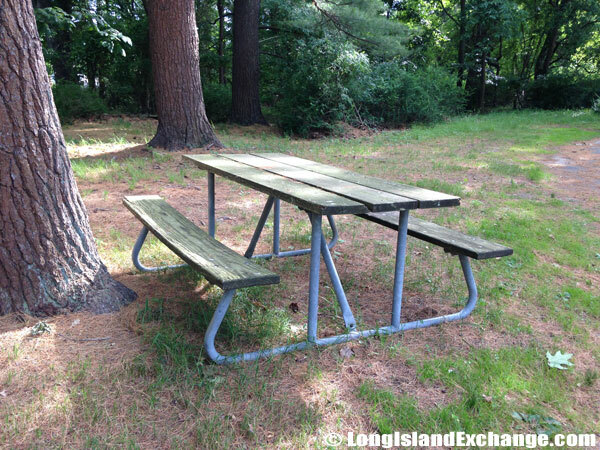 The permit can be obtained free by writing to the Long Island State Parks in Babylon, New York. A booth stands a few hundred feet inside the entrance of Connetquot River State Park to collect entrance fees. Overview: Visitors can enjoy activities that have low impact on conservation programs. The state park maintains 3,473 acres of land and water for the protection and propagation of game birds, fish and animals. Deer and waterfowl are abundant, rare nesting birds, including the osprey, are present and there are also plenty of rare plants, such as trailing arbutus, and pyxie moss in their natural habitats. 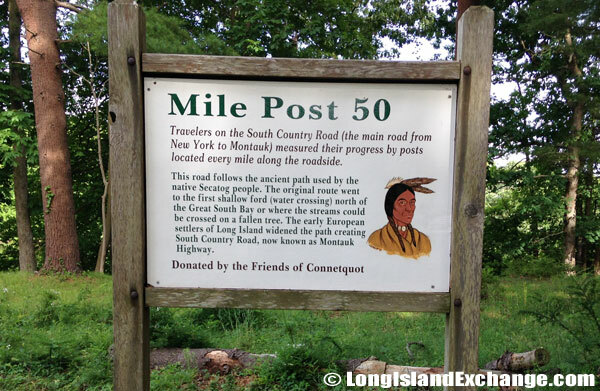 Mile Post 50 marks an ancient path used by the native Secatog people as the original route where travelers used the road to go from New York to Montauk with distances traveled measured by posts set one mile apart. Connetquot River State Park Preserve also has 50 miles of hiking, horseback riding, cross-country ski and nature trails, as well as fishing (by permit only) on the Connetquot River. It should therefore be on the Agenda of all those who profess to be hikers and those with an interest in the agricultural origins of modern Long Island. 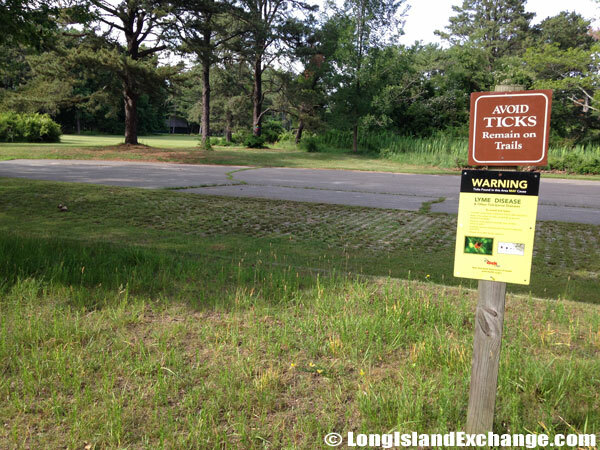 One of many signs at Connetquot River State Park warning visitors about ticks and how to stay on the paths and to avoid grassy areas. History: As recently as 1978, the Park was rescued from the clutches of private individuals, and is now under the professional care of the State administration. It had functioned as a hunting ground for wealthy owners who would hunt in its secret stretches and dip in to the river for delicious trout. Much of the Park lies at the edge of the Moraine from the Ice Age, so there is much area with residual debris that makes for sandy top soil. Such zones bear species of pine trees with deep root systems that can reach in to well hidden aquifers. The Park makes best use of varying soil textures that it has been handed, to build a handsome collection of both slender trees that reach far in to the sky and some with more generous girth. 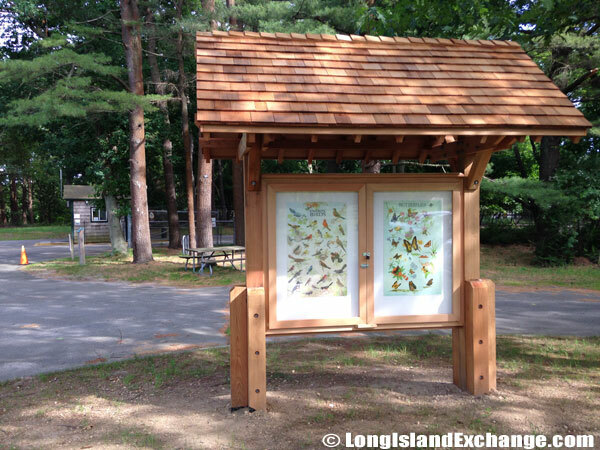 Connetquot River State Park information board with images. Facilities: 50 miles of hiking trails, bridle paths ($25 permit required, no horse rentals), museum, and gift shop. Grist mill, fish hatchery and main house tours by appointment. It also offers nature walks, family, children, youth, and scout programs. A resting point with restrooms, picnic tables and drinking water. Seasons/Hours: The preserve operates year round. 6 a.m.-4:30 p.m. Tue.-Sun. April through September; 8 a.m.-4:30 p.m. Wed.-Sun. October-March. Permit required. 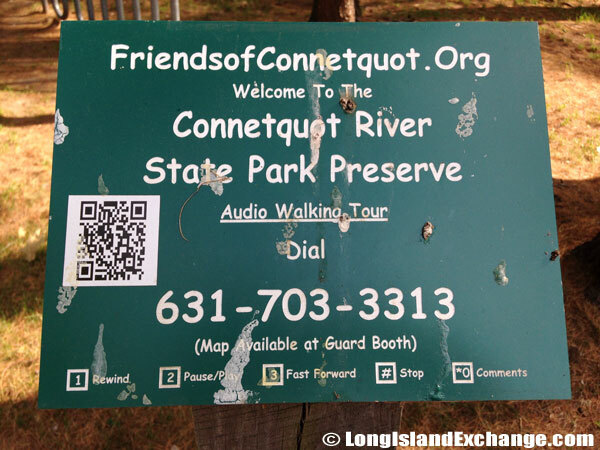 The Friends of Connetquot, a nonprofit organization, offers a walking audio tour of Connetquot River State Park. Events: Delightful Dragonflies, Bat Safari, Singles Hike, Nature Scavenger Hunt, and Incredible Insects (dates not set).